Billie Holiday Fans: Deal of the Century! 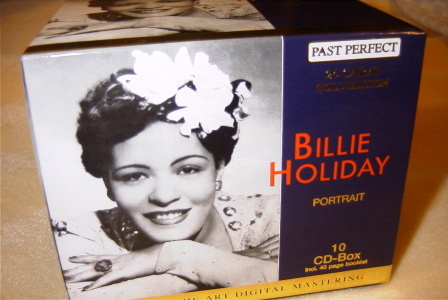 This ten CD boxed set "Billie Holiday: Portrait" (German Import) includes 170 or so recordings from the 30s and 40s plus a 40 page bio booklet for the amazing price of $26.69 plus $2.49 media rate shipping. I ordered my set from HTF Imports through Amazon Marketplace and it arrived nine days later. What a voice. Highly recommended! iTunes is currently playing: Solitude from the CD set Billie Holiday: Portrait .